Edge 30" Bath Bar is a striking lighting collage. The asymmetry of one edge that's squared and one that's rounded gives Edge the sensation of a glass form whose movement is captured by precisely edged polished chrome finish brackets. 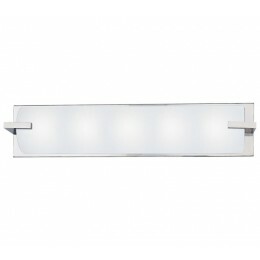 Edge brings unique modern design and ideal illumination to a contemporary bath. 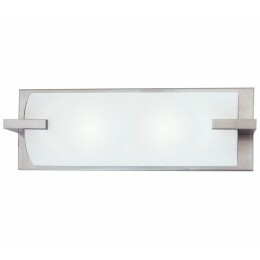 The Sonneman 3795.13 Edge collection Vanity Wall Lighting in Satin Nickel uses Xenon light output and brings Modern style. This item is 5.5"H x 30"L x 5.5"D. The wattage is 160. The Sonneman 3795.13 requires 4 bulbs (included). Additional Information: Shade-White Etched Glass.